Fat bombs! Some people regard them as dirty words. The concept might not be that appealing to some but for those who have to meet their fat intake quota, fat bombs are godsend. I personally cannot eat a whole lot of fat bombs especially the ones that made from just oil and butter. They taste nice at the beginning but after the fat melts the texture feels weird and often makes me feel queasy afterward. One pet peeve about living in the tropic is that the fat bombs almost certainly will melt as soon as we take it out of the fridge. When we first started off, we tried making fat bombs from recipes found on the internet. 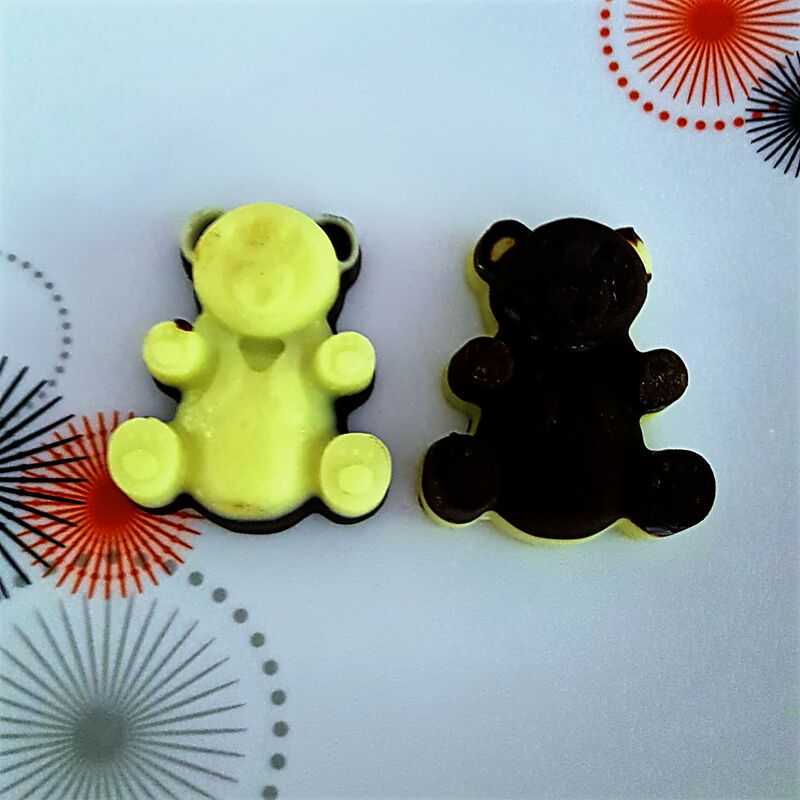 Our early days chocolate bears were made of cocoa butter, coconut oil and melted butter. We even tried to make it two-toned. 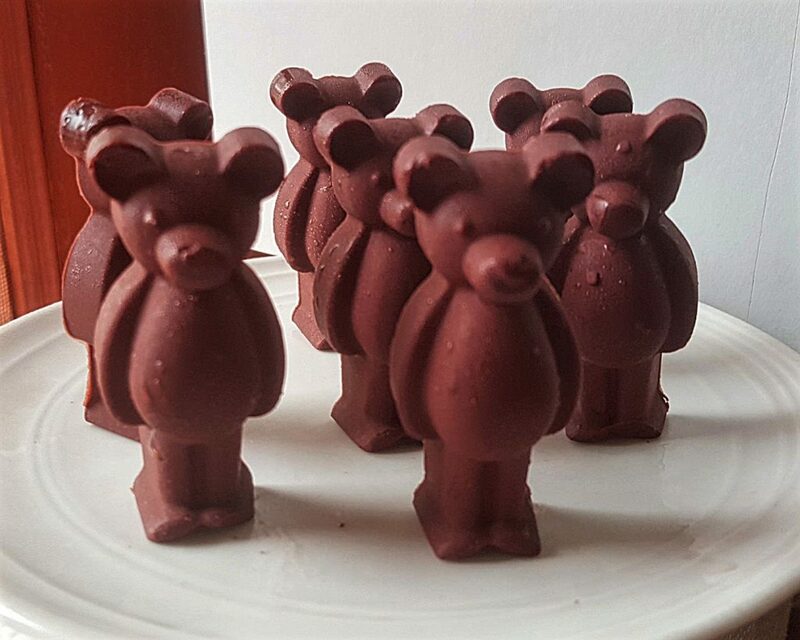 It seemed like a good idea at the time..😛 There was a little incident un-molding our bears: some of them lost an ear or part of their paws because the the chocolate was too brittle. But that didn’t stop us. 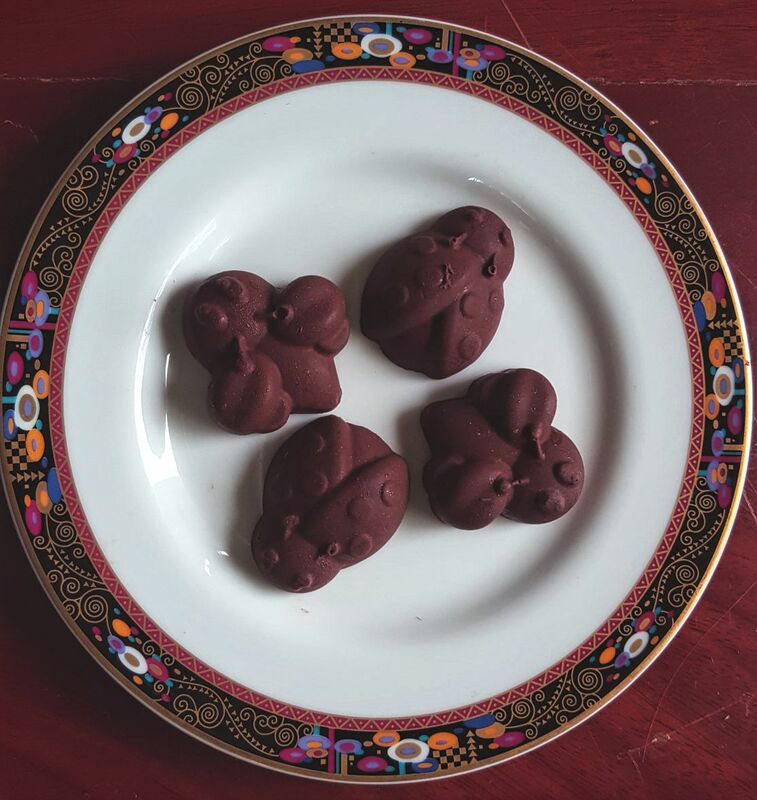 We bought a whole bunch of silicon molds online and used them for our fat bombs and we were so stoked to see perfect little morsels coming out of the molds. But alas, the joy was short-lived. The perfect shapes started to turn messy with melted fat. You want to put them on a plate and snap a photo but you would get traces of oil smear everywhere the fat bombs landed. The first fat bombs we made were very hard. You only have to take it straight out of the fridge and popped in your mouth and let it melt, which led to the problem about weird texture that many people can’t get used to.. This is a very quick and easy recipe. It only contains 5 ingredients; cocoa powder, liquid stevia, rum flavor, coconut oil and thicken cream. The ratio is 2 parts oil and 1 part cream. 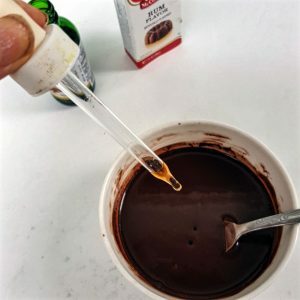 When mixing cream with oil, you run the risk of the mixture separating. To avoid that issue we would have to introduce the oil to the cream a little bit at a time and make sure it’s all blended before adding more oil. Here we mix cocoa powder with the cream first and it will form a very thick paste like this. Then we would start adding oil into the paste 1 tbs at a time and all the while stir, stir and stir. Once we have got all the oil mixed in, we can add the flavor and stevia drops. The mixture will be glossy and rather running, but no separation..hooray!! All that’s left to do now is pour into molds of your choice and chill. (Our molds hold 1 tablespoon each.) We stuck ours in the freezer to quicken the process. Fifteen minutes later and here we have it. These chocolate teddies still need to be kept cool in the fridge but they don’t go into melt down as fast and they are soft to the bite, which is what we like. 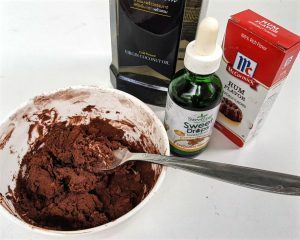 Put the cream in a small bowl and add cocoa powder. Mix the cream and cocoa till thick paste is formed. Slowly add coconut oil a little bit at a time and mix into the paste. Continue to add the oil and stir till well blended. 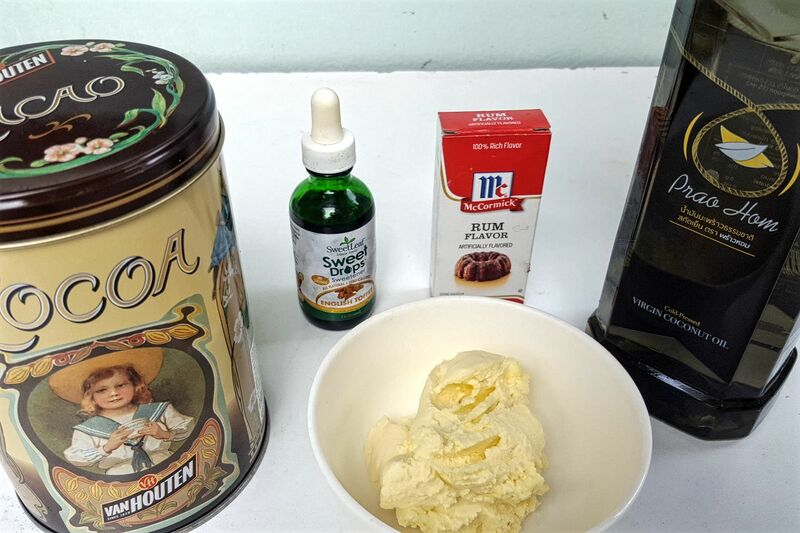 Add stevia drops and rum flavor and mix well. 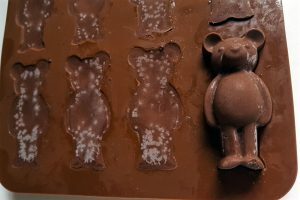 Pour into molds and chill till chocolate is set. This is our basic recipe. You can add any flavor you like. The possibility is endless. We have made it with orange and mint extract and it was very nice. Our Thai coconut oil has a lovely coconut smell which you can't get from coconut oil produce elsewhere. We sometimes don't put any flavor into the fat bomb and still have nice coconut flavor chocolate.